I’ve got bad news for those of us who don’t want to live in an automotive landscape solely populated with bloated SUVs and slightly less bloated crossovers: We’re boned. 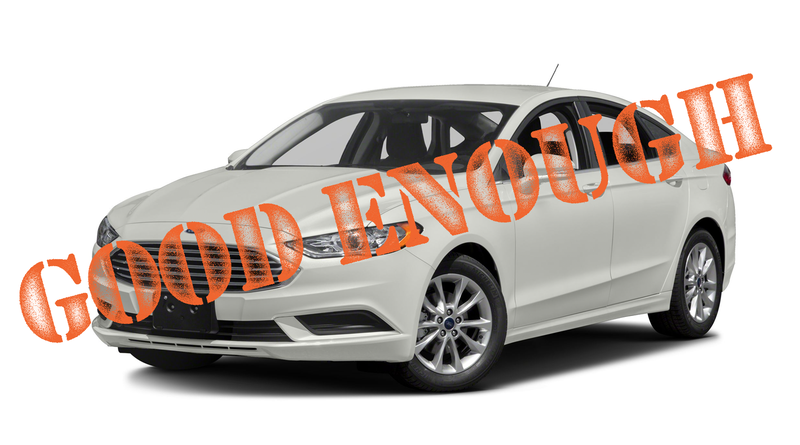 In case you’re still hopeful, here’s a bit of news that should kill that optimism: Ford just cancelled their refresh of their Fusion mid-size sedan, because no one cares. The Detroit News obtained a letter sent by Ford to suppliers that announced that the planned redesign for the 2020 model year Fusion had been cancelled. This doesn’t mean the Fusion itself is gone, just that Ford doesn’t think a redesign is worth it, or, perhaps more likely, a more dramatic redesign/re-casting of the Fusion nameplate may be in the works. ... which, of course, means just about nothing. The article also revealed the shocking information that Ford still sells the Taurus, which I totally forgot was still a thing until just now. FCA is no longer making the Dart or the Chrysler 200, and there’s an overall and pervasive lack of interest in mid-size sedans globally. This is mostly due to the SUV and crossover replacing the sedan as the default family car of choice, but some blame should be placed on most mid-sized sedans themselves, which, let’s face it, tend to be pretty boring. There’s no sign this trend will stop. As it is now, if you love mid-size sedans now is the time to start a mid-size sedan messianic cult, and desperately hope and pray for one exceptional, unignorable, irresistible mid-size sedan to come to the market and re-take what was once theirs. I believe such a sedan will be the Second Coming of Saturn. In Saturn’s name, we pray.